Sep 30, 2014 | By CENS | MAG CITY CO., LTD. Founded in 1990, Mag City Co., Ltd. has grown into a veteran specialist in the development and production of a wide array of magnets and magnetic- application products mainly on OEM/ODM basis. The ISO 9001: 2000-certified company currently has an annual production capacity of 50,000 metric tons of magnetic products and materials, which can be exported from either China or Taiwan depending on customer needs. The firm's factory in China is a modern integrated facility equipped with the most advanced production equipment available, as well as various testing and inspection instruments. 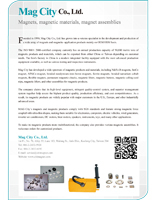 Mag City has developed a wide spectrum of magnetic products and materials, including Nd-Fe-B magnets, SmCo magnet, AlNiCo magnet, bonded neodymium-iron-boron magnets, ferrite magnets, bonded samarium cobalt magnets, flexible magnets, permanent magnetic chucks, magnetic filters, magnetic buttons, magnetic calling-card nips, magnetic lifters, and other assemblies for magnetic products. The company claims that its high-level equipment, stringent quality-control system, and superior management system together help assure the highest product quality, production efficiency, and cost competitiveness. As a result, its magnetic products are widely popular with major customers in the U.S., Europe, and other industrially advanced areas. MAG City's magnets and magnetic products comply with SGS standards and feature strong magnetic force coupled with ultra-thin shapes, making them suitable for electronics, computers, electric vehicles, wind generators, inverter air conditioners, DC motors, liner motors, speakers, instruments, toys, and many other applications. To make its magnetic products more multifunctional, the company also provides various magnetic assemblies. It welcomes orders for customized products.